When I started work on The Art of Community I was really keen that it should be a body of work that all communities have access to. My passion behind the book was to provide a solid guide to building, energizing and enabling pro-active, productive and enjoyable communities. I wanted to write a book that covered the major areas of community leadership, distilling a set of best practices and experiences, and illustrated by countless stories, anecdotes and tales. But to give this book real value, I was keen to ensure the book could be freely accessed and shared. I wanted to not only break down the financial barrier to the information, but also enable communities to share it to have the content be as useful as possible in the scenarios, opportunities and problems that face them. To make this happen O’Reilly needed to be on board to allow the book to be freely copied and shared, in an era in which these very freedoms threaten the publishing world. But they came through. Thanks to the incredible support of Andy Oram, my founding editor for the book, O’Reilly were hugely supportive of the project and our desire to break down these barriers. Today I am pleased to announce the general availability of The Art Of Community under a Attribution-Noncommercial-Share Alike license. Share Alike â€” If you alter, transform, or build upon this work, you may distribute the resulting work only under the same or similar license to this one. Firstly, buying a copy sends a tremendous message to O’Reilly that they should continue to publish books (a) about community and (b) under a Creative Commons license. Secondly, it will encourage O’Reilly to invest in a second edition of the book down the line, which will in turn mean that communities around the world will have a refreshed and updated edition that is available to them. Thirdly, aside from the voting-with-your-feet side of things, it is just a really nice book to own in print. It is really well made, looks stunning and feels great to curl up with in a coffee shop or on the couch. Even if you don’t buy it, I would be hugely grateful that if you like it, please go and review it on Amazon. This is a hugely contribution. Thanks! 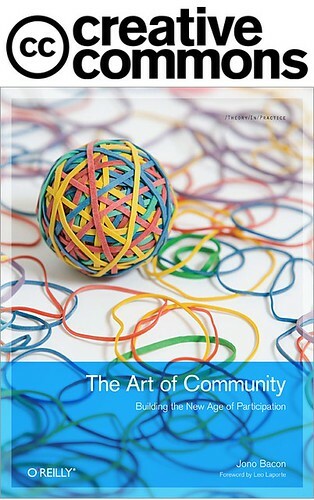 You can download the The Art of Community here. Good Stuff Jono. I think I’ve started becoming a fan, finally, after LUGRadio and FLOSS Weekly and now the book. I’m glad you decided to make it freely available. I’ve just ordered this book. It’s so great!! Thank you, Jono. Also just ordered your book. Kudos for the openness and sharing. Fascinating to read and very useful for anyone who’s a part of any community. I am a rank beginner and I was looking for this exact information. Lucky for me I found your site at the beginning of my searching. Yeah … Here people used to say: ABC teach – in all hut shout:). Even though I knew there was a strong possibility that you would release this under some form of CC (I would have been very surprised if you hadn’t, keeping in mind the nature of your work), I still ordered a paper copy the day it became available for a couple of the very reasons you listed toward the end of your post. In my mind, it’s also kind of like the deal with Ubuntu CDs. You can either download it for free, or you can buy one from the shop. To my mind, if you have the means to purchase something like this, then by all means why not do it? This is motivation for the creator and also demonstrates proof that demand exists for such information, which facilitates and encourages their creators to continue to produce such great work. If you have not yet purchased a copy, I strongly encourage you to do so. I’m about halfway through it, and not only have I gleaned information valuable to my work in the free software community, but also tools which I can add to my kit in my day to day job as a manager. It’s just a great book all the way around, and I would not hesitate to recommend it to anyone who has to deal with people issues in almost any capacity. Thanks, Jono, your work is very much appreciated. not all your books are CC and cheap ..
BTW http://www.artofcommunityonline.org/ needs a bigger host. It does not respond. Why, oh why has it bo be 30 euro on amazon.de but only $34 on .us? I’m so glad to see your book released in this way (heard about it through FLOSS Weekly). I’m a grad student in Paris studying “civil society development” and I’ve just started a student club to promote the use of Free and Open Source software on campus. Your book will be a big help to me practically as I try to build FOSS awareness at my university and maybe it’ll play a part in my studies as well. Glad to see your webmaster sorted the bandwidth problem, too! It’s 2.27 megabytes. That info is useful for those with limited bandwidth. Please consider putting that info next to similar links. It promotes polite behavior, like using ‘at’ to schedule large downloads off-peak. Thanks. As a Free software evangelist I would have thought you’d be against publishing your book on Amazon’s defective-by-design Kindle e-book platform. Was that O’Reilly’s idea or yours? Looking forward to reading my downloaded copy and lending the dead-tree version to my boss when it arrives. I evangelize free software, but I am not against using non-free software devices and options. I own a Kindle and I love it, but I was really keen to have a free version available too. As such, everyone is happy: you can buy a book, a Kindle version or download a free PDF. I am also planning an audio book. When do you hope to have an audio book available? Jono, Thanks for a great book. I’ve included the link on my site, Loads of Linux Links, under Advocacy and Documentation–Publications–Books. Hope this gives you more publicity. Many thanks for the book ! Very generous of you. It’s an inspiration to work out a new training – I’m a specialist in collaboration/team working – together with a good friend of mine Mic Adam, a sociale media/conversation policy specialist.